Intel’s latest roadmap has been leaked by VR-Zone which shows that the chip giant would launch its Ivy Bridge-E High-End Desktop platform in Q3 2013. Haswell Core i7/i5 on the other hand launches earlier in Q2 of 2013 around April while Core i3 would be launched later in Q3 same time as Ivy Bridge-E launch. The Ivy Bridge-E processors would be compatible with LGA2011 socket which was launched last year with the Sandy Bridge-E platform further maximizing its lifespan and allowing users to upgrade to the latest 22nm Enthusiast processors. Although it is not known if chipset would remain X79 or a new one would be launched with tweaks and minor updates. 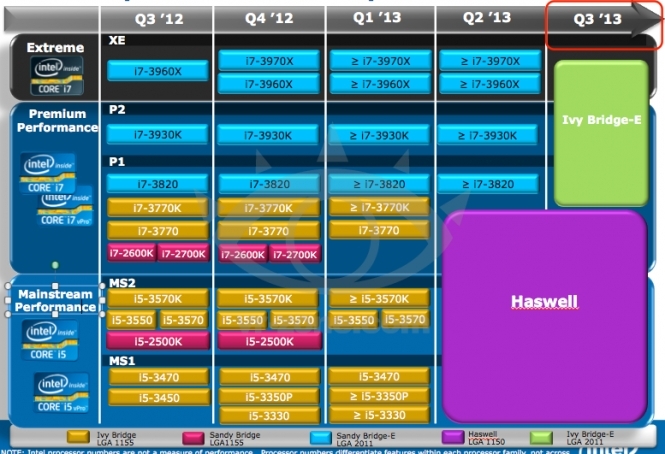 The Slide also shows the Core i7 3970X processor which launches in Q4 2012 to replace the flagship i7 3960X. There’s also chances of further models to the Sandy bridge-E and Ivy Bridge lineup during Q1-Q2 2013 as represented by the equal and greater to symbols. More details on Ivy Bridge-E here and Haswell here.